Saw blade “kerf” refers to the thickness of the slot which the saw blade will cut. It is often used as well to define the thickness of the blade itself, or at least the widest point on the blade, as this will define the width of cut made. The thickness affects the cutting width, cost, power consumption, and the amount of wood lost during the processing. Kerf is generally wider than the blade plate. If you look at the construction of a carbide tipped circular saw blade, you will note that the blades teeth are welded onto the blade plate, and are thicker than it. In the case of high speed steel saw blades, the teeth are integral with the blade, although the kerf is still thicker than the thickness of the blade plate. This is caused by the teeth being “offset” from the blade. All that means is that they are bent slightly to the side, alternating sides from one tooth to the next. One more thing that can affect the saw kerf is the flatness of the blade. If you can imagine how a blade would look that is slightly warped. In that case, the teeth would not follow each other in the exact same line, but rather wobble back and forth a bit, much as a car tire that is mounted on a bent rim. This wobble would actually cause the blade to cut a wider kerf than the thickness of the teeth warrants. Since sheet metal is often rolled at the mill where it is forged, then unrolled and cut into sheets, before fabrication, it may not be totally flat. While your eye probably cannot see the amount of curve in the blade, it can still cause the saw kerf to be greater than the thickness of the blade and teeth warrant. Extremely high grade circular saw blades are made from steel that wasn’t rolled at the steel mill. This steel is much more costly than regular sheet steel, due to the increased labor involved in handling it in processing. However, a blade made with this type of steel will have no wobble, making for the smoothest possible cut. Saw blade kerf is generally measured in thousandths of an inch. A typical “full kerf” blade will have a kerf of about 1.110”. Some heavy duty blades can have a kerf of 0.125” (1/8”) or even 0.172” (11/64”). 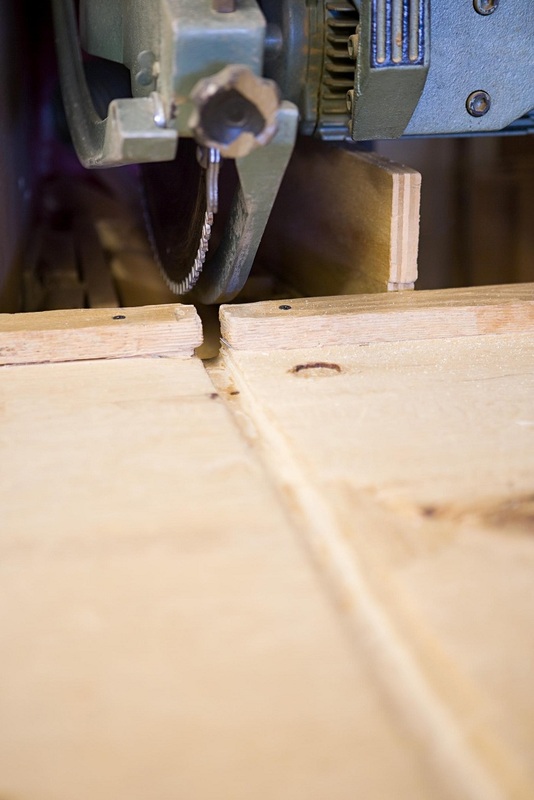 If kerf is too thick for a weak circular saw (saws ranging less than 2 HP), it will rotate below the average speed and start to grind the wood. Thin kerf blades will generally be 25% thinner, creating a cut of 0.091” or about 3/32”. The thinnest kerf circular saw blades currently made are 0.059” (about 1/16”) thick. This is especially helpful for making precise cuts on engineered lumber or plywood. These thinner blades cannot absorb impacts so well, and are more prone to bending from stress than thicker blades. Therefore it is extremely important to ensure that the wood doesn’t twist in the saw, jamming the blade and possibly bending it. The blade plate on thin-kerf shouldn’t be bendable at any cost; in order to run straight, factory-engraved expansion slots are used to prevent overheating and possible deformations. Although they can be resharpened, they tend to get dull quicker and not be resharpenable as many times. So, with this risk from thinner kerf saw blades, why would any woodworker want to use them? The major reason for using thin kerf blades is to save materials. When one is working with exotic hardwoods, which can run as much as $60.00 per board foot, even 1/16” inch of wood is important to save. Every scrap is usable for something. Just multiply the thickness with the width and length of sheet and now look at the total amount of wood that’s saved. Next to the less material loss, benefits like competitive price, lightweight and possibility to mount them on every circular saw, no matter is it weaker or more powerful, make thin kerf saw blades a favorite choice among woodworkers.